At this point in the process you should be thinking about where to put your belongings and paper so they will be accessible the next time you decide to use them. After all, that is what being organized is all about—-being able to find the things you need, when you need them. Many individuals will ask us the ‘right’ place to store something. The only ‘right’ place is the one that makes sense to you. Therefore, we suggest that you think about how you will look for something the next time you need it, and select this locale as its new home. As an added tip, we suggest that items be stored in close proximity to where you will be using them. The candle drawer we have been working on is in the dining room of a home—close to where candles will be used at a dinner party or birthday celebration. 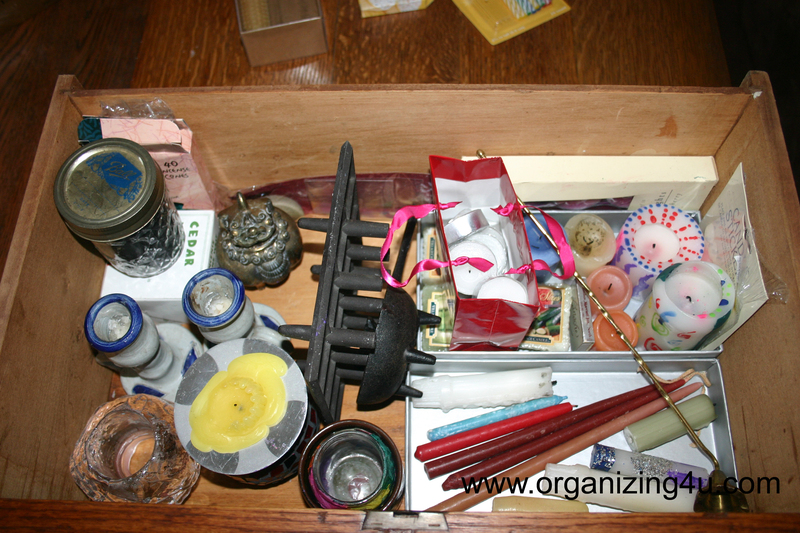 As you can see, everything the homeowner wants kept in this drawer fits neatly inside. No more digging for a particular item when needed. If you are the type of person who will forget about a piece of paper or an article of clothing if you cannot see it, there are alternatives available. Check out your local office supply or department store for more visible storage solutions. Think outside of the box (so to speak). If you like to pay your bills at the kitchen table, then perhaps you should consider putting all the related information in a small portable tote. When finished, you can place everything inside, and still have a place for dinner. We recommend that when you store important paperwork and documents, you tell someone you trust where the information is located. This could be a friend or family member, your attorney and/or your insurance agent. Then, in the event of an emergency, that someone will easily be able find what they need. The Organizing 4 U team’s book Where Can I Find It?© is a useful tool to guide you as you find homes for all of your important documents. Have you been finding new homes for some of your items?